“Journalist Chrystia Freeland has spent years reporting on the people who’ve reached the pinnacle of the business world. 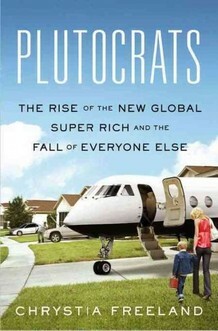 For her new book, Plutocrats: The Rise of the New Global Super-Rich and the Fall of Everyone Else, she traveled the world, interviewing the multimillionaires — and billionaires — who make up the world’s elite super-rich. Freeland says that many of today’s richest individuals gained their fortunes not from inheritance, but from actual work,” quoting NPR. Click here for “an excerpt from Chrystia Freeland’s new book, Plutocrats, on the strange absence of female billionaires,” quoting The Daily Beast. “Today’s plutocracy, as described by Chrystia Freeland, can make for an ugly spectacle. It is an increasingly stateless and distant class. The very rich may sometimes dress scruffily or express an affection for common tastes, but their wealth naturally separates them from the rest of the public. It isolates them physically, as they flit from palace to palace in private jets. And it isolates them psychically, as they grow comfortable with the view that their wealth is not merely the fruit of talent and work but the mark of superiority. Their wealth and isolation often contributes to a shortfall in empathy (or exacerbates a pre-existing condition, which may have helped raise them to plutocratic status in the first place). They are more likely to feel deserving of rewards, well-earned or ill-gotten. And they are less likely to feel a twinge of hesitation or regret when inflicting hardship on business partners or employees in the name of efficiency and profit,” quoting Ryan Avent for Reuters.